Happy New Year everyone! Hope you are onto to your 'January' healthy eating resolutions! While I can almost never make resolutions, I plan to work out (sorely lazy at it) harder than ever because we do eat moderately well balanced food otherwise. One thing that really helps is to have some dips and relishes in the fridge for times I crave something hearty but not necessarily skinny. Last evening snack was this relish and I realised I had this post in drafts for over a year. It was a cool breezy summer evening in Turkey, some four years back when we first had the relish. Antiochia, the restuarant was busy and buzzing with people, but also had a sort of mystical aura in its setting in the old European district of Beyoğlu. We happened to get talking with our neighbouring table (yes, tables are that close! or at least were that day) a Swiss couple living in Turkey, helped us select items from the menu. It could be their expertise or the chef's perfection but everything tasted beyond delicious. One thing in particular, that won us over mostly because of its cheer simplicity was the red and green bell pepper walnut relish. Ever since that holiday, this relish has become a part of our family recipes. Over the years, I have played around with it so much, I don't even remember what the original tasted like but this sure tastes good! Green bell pepper adds a wonderful pepperiness to it but for those of you who don't like green bell pepper, just use more red pepper. Also, try to source Turkish labneh which is very creamy and perfectly tangy. Preheat the oven to the lowest possible setting. In a baking tray arrange the garlic, and bell peppers. Drizzle with 1 tbsp olive oil and put it in the oven for an hour. Mix the roasted garlic pulp with labneh. Season with salt and pepper. Keep aside. Remove the skin on the pepper and chop into small cubes. Chop the walnuts. Whisk together the remaining oil, pomegranate molasses, lemon juice until creamy. Add the peppers to it. 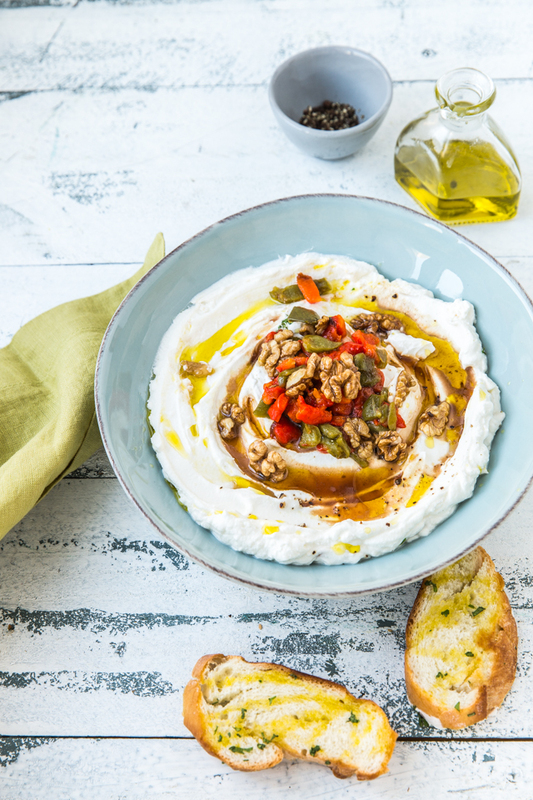 Drizzle the relish on labneh and garnish with crushed walnuts. Serve with toasted or fresh baguette or pita bread. Such a yummy dip! Looks awesome! That looks so amazing Kulsum. Love it. Sounds amazing and just the kind of thing I could snack on all day! I've only just discovered your blog and it is wonderful. We're vegetarian and there's lots of brilliant inspiration on here. Please keep it up!